In late 2003 and 2004 several Southeast Asian zoos that kept large cats found to their dismay what happens when you feed bird flu infected chicken carcasses to tigers and leopards. The following comes from a World Health Organization GAR report from 2006. Several published studies have demonstrated H5N1 infection in large cats kept in captivity. In December 2003, two tigers and two leopards, fed on fresh chicken carcasses, died unexpectedly at a zoo in Thailand. Subsequent investigation identified H5N1 in tissue samples. More recently, in 2012 the OIE reported on Cats Infected With H5N1 in Israel, while last year we saw Guangxi Zoo Reports 2 Tiger Deaths Due To H5N1 and last June we saw reports of Fatal H5N6 Avian Influenza Virus Infection in a Domestic Cat and Wild Birds in China. While leopards may not change their spots, influenza viruses are constantly evolving, either through antigenic drift or by reassortment with other viruses. As a result, today's H5N1 viruses are quite different from those that killed hundreds of tigers back in 2003-2004 (see graphic at the top of the page). And as these viruses evolve, so too may their behavior. Over time a virus's host range, transmissibility, pathogenicity, antiviral resistance, and susceptibility to vaccines may all change. It is for this reason we must continually monitor, and reassess the threat, of novel flu strains. A few days ago Scientific Reports published a report on three recent (2014-2015) H5N1 related tiger deaths in a Yunnan Province zoo (in early 2015 we also saw Guangxi Zoo Reports 2 Tiger Deaths Due To H5N1) which occurred over an 18 month period. 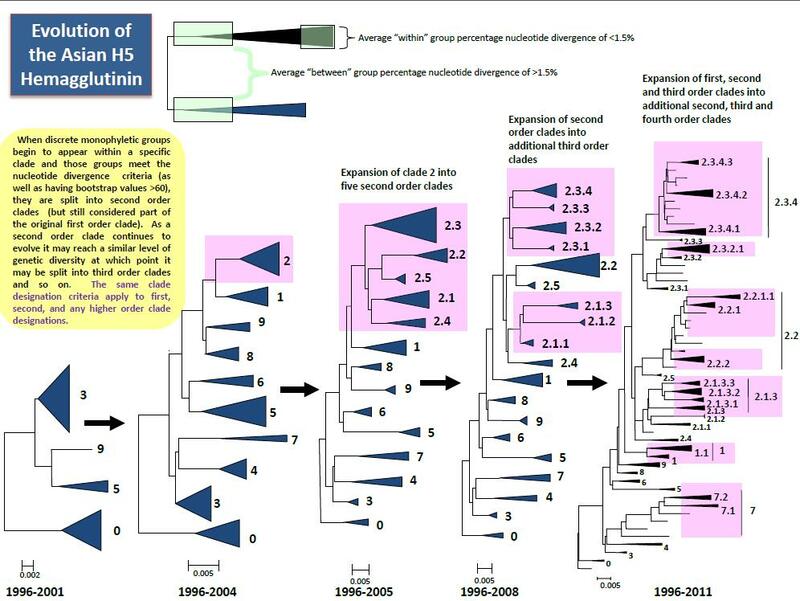 Of particular interest, all three viruses represented different clades of H5N1. A/tiger /Yunnan /tig1508 /2015(H5N1) clade 2.3.2.1c reassortant with three internal genes from the A(H9N2) avian virus. Not only does one location being hit by three different clades of H5N1 in less than two years highlight the growing diversity of H5N1 viruses circulating in China, these researchers also found molecular markers associated with increased virulence and transmission in mammals in all three isolates. In summary, all of mutations/substitutions of the gene segments of the tiger originated viruses could contribute to the enhancement of virulence or the increase of the H5N1 virus binding to the α2-6 receptor. 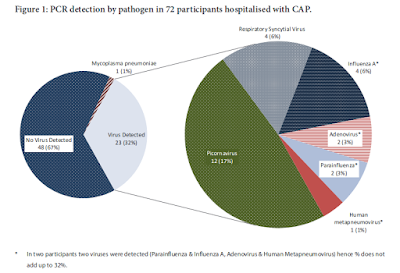 This is potentially important because avian adapted flu viruses bind preferentially to the α2-3 receptor cells found in the gastrointestinal tract of birds, while humanized influenza viruses need to be able to bind to the α2-6 receptor cells found in the upper human airway. None of this means that HPAI H5N1 is ready for prime time, but it does suggest the virus may be becoming better suited to mammalian hosts. The authors also documented replication and pathogenicity in mice, and a loss of effectiveness of China's RE-6 vaccine against the most recent (Aug 2015) tiger isolate. Follow the link to read the entire report. From 2014 to 2015, three cases of highly pathogenic avian influenza infection occurred in zoo-housed north-east China tigers (Panthera tigris ssp.altaica) and four tigers died of respiratory distress in succession in Yunnan Province, China. We isolated and characterized three highly pathogenic avian influenza A(H5N1) viruses from these tigers. Phylogenetic analysis indicated that A/tiger /Yunnan /tig1404 /2014(H5N1) belongs to the provisional subclade 2.3.4.4e which were novel reassortant influenza A (H5N1) viruses with six internal genes from avian influenza A (H5N2) viruses. The HA gene of the isolated A/tiger /Yunnan /tig1412 /2014(H5N1) virus belongs to the subclade 2.3.2.1b. The isolated A/tiger /Yunnan /tig1508/2015 (H5N1) virus was a novel reassortant influenza A (H5N1) virus with three internal genes (PB2, PB1 and M) from H9N2 virus and belongs to the subclade 2.3.2.1c. In this study, we provide the evidence of fatal H5N1 AIV infection in zoo-housed Tigers in Yunnan Province. 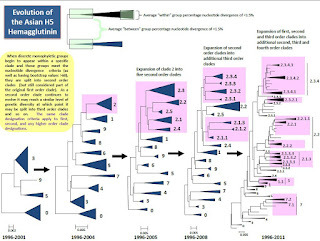 In comparisons of previously published nucleotide sequences with those of other avian influenza viruses from public databases, the isolated three tiger-originated-viruses (specially the tig1404 and tig1508 isolate) had a high level of homology with the recently identified HPAI H5N1 viruses, which circulates mainly in chickens and other avians in Yunnan province at the same time7 and the southern provinces of China or Southeast Asia, but low levels of homology with isolates from tigers in Shanghai, Jiangsu and Thailand6,21,22. Thanawongnuwech et al. previously reported that H5N1 influenza virus transmission occurred between tigers in Thailand in 200423. In the case On August 12th, 2015, RNAs from the two died tigers tested positive for the HA and NA gene of the H5N1 virus. The virulence in mice indicated that the tig1508 virus maybe have the ability for transmission and infection in mice through direct contact. Our results suggested that the reassortant different H5N1 virus subclades can successfully cross species barriers from avian to mammal and infect north-east China tigers which might be with the contribution that mutations/substitutions of the gene segments in the tiger originated viruses could enhance virulence or increase the H5N1 virus binding to the α2-6 receptor.